During last two decades almost all industries, especially electronics, have been greatly stimulated by aspiration for miniaturization of all devices. Practically all those devices which used to be brick-esque in looks and weight, now easily disappear in a briefcase or a bag. 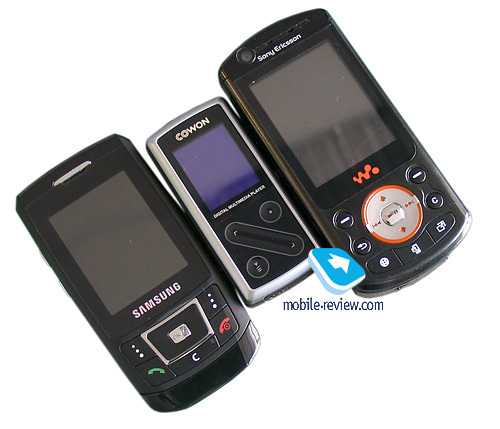 Of course, having created a compact casing it is impossible to downsize a handset, notebook or audio player outright; you should always do it with diminutiveness of details which the device is made of in mind. 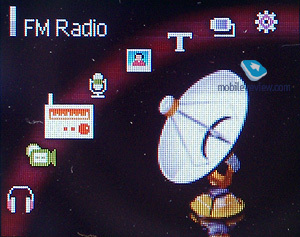 That is, new trends should touch all the components, from radio module and battery to controllers and displays. Such things do happen, but these parts are getting more petite at uneven paces, which is quite natural: some react to new trends quicker and some lag behind, improvements of present technologies get immediately implemented, but interesting, novel and offbeat things are waiting for their big hour. This process has a reverse side, the device’s size remains unchanged due to the already shaped up form-factor but other parameters are growing. It is easily demonstrated by the example of hard drives: there is a couple of common form-factors, i.e. cliches for casing form and dimensions. But within these standards the capacity is steadily growing larger, while the price, which is really important, is dropping down. See for yourself: in 1996 a conventional 850 Mb PC hard drive went for 300 USD. Ten years later, a drive of the same size contains several hundreds of gigabytes, while the price is cut in half. In the recent years the development of portable devices, requiring more capacity yet incompatible with drives of the existing form factor in view of the objective reasons, has encouraged the search for new ways and solutions. Ever-growing popularity of so called “jukeboxes”, audio players carrying hard drives onboard, played a significant part in this. Back then (5-6 years ago) nobody would ever have dream of watching video or viewing photos with such gadget, they cared rather for able storages for large music collections converted in MP3 format, which was all the rage. At first, notebook hard drives stepped onto the scene, but they never qualified, due to being too bulky. Hard drives makers came to save the day – they got which way the wind blown in time and quickly delivered 1.8-inch models and then shrunk them all the way to 1 inch. While the capacity was lower than that of their full-size siblings, it was quite enough for music-minded application. Hard drives firmly grasped the crown of capacity/price ratio, leaving flash-memory far behind. Thus, several years ago the audio players market was split into two camps: flash-models with relatively subtle storage space and multi-gigabyte “combines” or jukeboxes and PMPs. Though, with time, one more segment emerged: portable players with so called “micro drives” inside – 1-inch and super small 0.85-inch drives of low capacity. Under “low capacity” I mean 3.4 Gb and more, the ceiling, if there is nothing wrong with me, is 12 Gb. Players with these drives were aiming to occupy the niche between flash-devices, whose storage space was only climbing up to the 2 Gb watermark and the capacious jukeboxes. But, so happened, that the growth in production accompanied by simultaneous landslide of prices, put paid to the manufacturers’ plans. 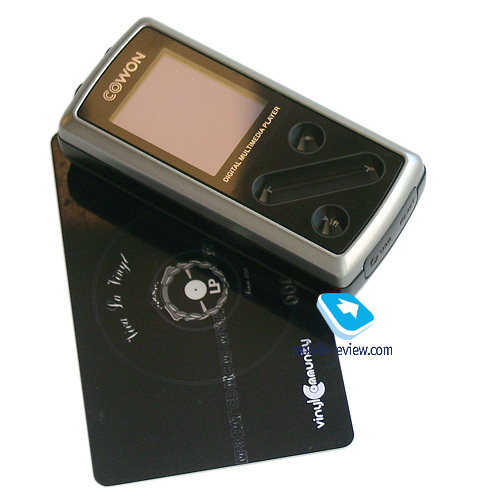 This way our review unit Cowon iAydio 6 is one of the last representative of this kind. For fairness’ sake let me note that in spite of all external factors, Cowon’s player has proven to be rather good and well worth the attention. 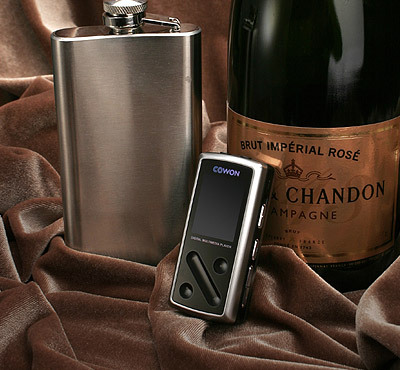 Cowon Audio 6 utilizes a diminutive 4 Gb hard drive with 0.85-inch drive diameter. As for the rest, the player doesn’t differ from a flash-stick. 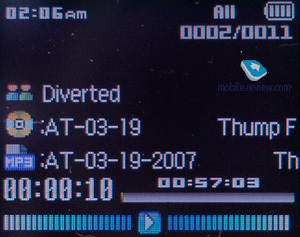 The device sports petty color display, supports main video formats including a number of exotic formats; FM-radio and built in voice recorder are also present. Now onto less popular features - the iAudio 6 boasts the line in and USB host function for plugging in internal devices omitting PC. 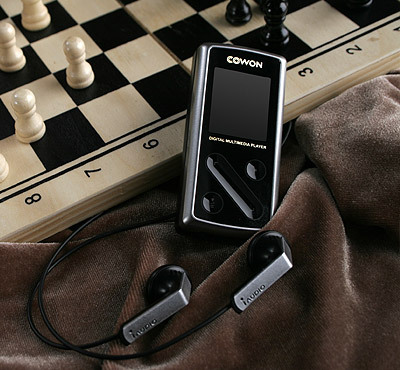 The Cowon iAudio 6’s casing bears much resemblance to conventional battery-powered flash-players which were sought-after a few years ago. This form-factor is called candy-bar due to its visual similarity to a chocolate bar such as “Mars”. In spite of the absence of any novelties in the design the player looks quite nice, mostly due to the balance between the size and shape of the elements – this effect goes through other Cowon’s models ( (but not in all of them). Personally, for me, the benchmark of a candy-bar has been model U3 released a couple of years ago. The build quality there is nothing to dwell upon. Everything is on the high level, panels are well-matched. Making quality shells has also become a good tradition in the “player industry”: the moment the competition got tough, the manufacturers realized that cheap plastic with curved buttons would do no more. However some “gems”, especially among private label (brands of major companies which are not involved into production directly) are still around. The components are located on Cowon iAudio 6’s casing in the following way: the left-hand side of the front fascia is occupied by the rectangular display, on the right you may find the touch-sensitive pad. The rear and the side plate are bare, the upper spine plays host to the microphone hole, the power switch, the controls locker and also three standard keys. Finally, the edges are taken up by various sockets – on the left is the headphones jack and the line in, both are classic 3.5 mm slots, on the right you will find the USB jack and the reset button covered with a firmly sitting plastic flap. The special control system is one of the iAudio 6 traits, however it follows recent splash of touch-sensitive controls popularity which have been embraced by everyone but a really a lazy person. It worth mentioning, that even being touch-sensitive the player’s interface doesn’t resemble anything we have seen before, which brings some bonus points to the company’s designers. As the matter of fact, there are only three touch-sensitive components, all of them placed on the fascia on the right of the display. These are two round buttons and one scroll stripe, mounted diagonally because of the very limited real estate of the front plate. It is pleasant that the touch-sensitive areas are provided with dents– it seems to be a subtle detail at first but in fact with their help the accuracy considerably increases. Using one pad you may start and stop playback, the second one is context sensitive, the stripe serves for navigating through lists. By the way, some more words on the stripe. In spite of being small in size in practice it offers great performance: the cursor soars through the lists very quickly and holds still precisely in the place you need. So in general the way the player is managed deserves only a positive mark, generally Cowon’s approach to implementation of the player’s controls leaves a good impression, the D2 alone is quite something. Keeping in mind the dimensions of iAudio 6 casing which are more then petty for HDD-players it is difficult to expect the player to put up some outstanding performance on the graphical front. On the other hand, the display player has, is eye-candy and in general proves to be rather good even with its 1.3-inch diagonal. 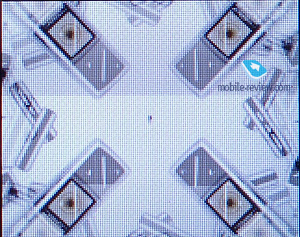 The display owes its sharp picture to OLED-matrix with 262 K colors. 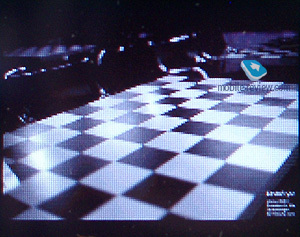 Generally, we should admit that OLED-matrixes used in players have already got rid of the “infantile disorders” such as whitish image and pale colors. And in the “wild” OLED is going head to head with with TFT-matrixes loosing only in terms price as yet. 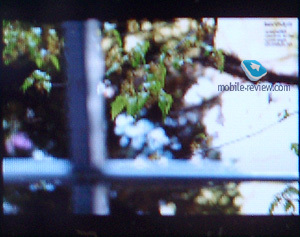 The image quality on the iAudio 6 screen is quite decent for a display with 160x128-pixel resolution which it has got. The interface designers seem to have worked out the fonts well in order to make captions maximally comfortable to read. As the result, the diminutive display accommodates 8 (eight!) lines which are, to say the least, a breeze to read. When viewing snaps vivid and bright picture is what you can’t overlook, however most of image details, of course, get concealed. 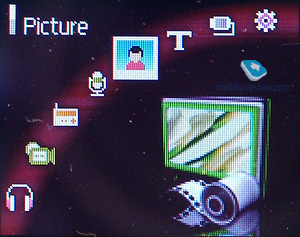 The main menu is displayed in an arch of diminutive thumbnails, upon item selection a large and well-animated icon appears beneath the arch. Should the section contain sub-items, they are displayed in a list; it is there where all 8 lines and the touch-sensitive scroll stripe become handy. 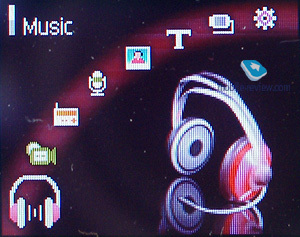 Menu structure: Music, Video, FM Radio, Record, Picture, Text, USB-host and Settings. 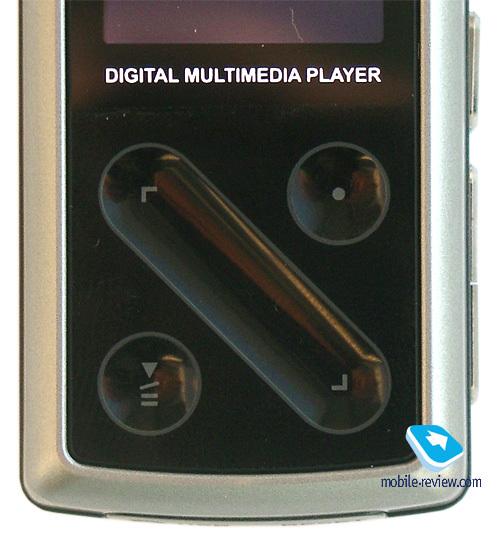 The first six switch the player to music playback, to video clips playback, FM-broadcasting reception, signal recording, viewing of graphic and text files respective. 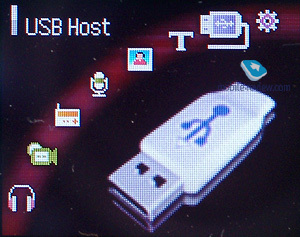 USB-host. A rarity for compact players – serves for plugging in external USB-devices. Settings. This item is the biggest one. 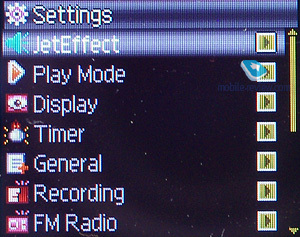 It contains 8 sub-sections and items which are presented by large icons: Jet Effect, Play Mode, Display, Timer, General, Record, FM Radio, Information. In fact, with the help of these menus you tweak the player’s sounding, as well as playback and information display modes etc. 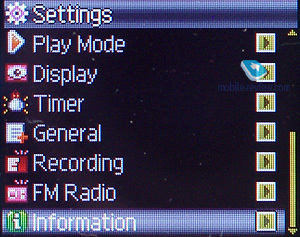 On top of that, here all timer settings are collected (auto switch-off, for example), and recording type and quality selection, FM-radio settings, including auto-tuning. 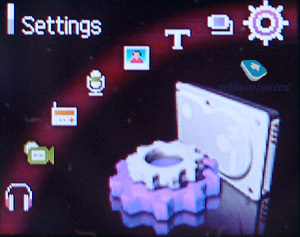 And finally, using the last item you can view the information on the device and current firmware version. 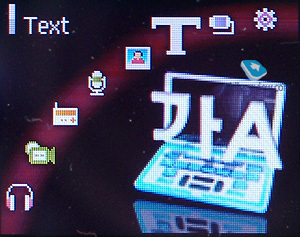 The menu’s layout suggests that the “Asian design” goes for interfaces of portable devices as well. At that, it is a breeze to work with, all settings are gathered in a certain place and can be brought up for respective modes. The Cowon iAudio 6 takes its energy from the built-in Li-Pol battery which is charged via USB-cable or mains adapter, but the iAudio 6 doesn’t come equipped with the latter. It takes the device about 3 hours to charge from empty to full via USB, so you can bear this. As the manufacturer claims, the battery keeps the player up and running for about 20 hours. In practice the iAudio 6 lasted for about 15 hours with dozens of turn-ons/offs and other stamina trials. The player is linked up to the PC via USB (I always ponder over using this phrase – can’t remember a player with something different onboard). OS recognizes the player as a portable storage device thus for all manipulations with it standard tools are used. Here we could only praise Cowon courage in front of “copyright protectors” prohibiting free music copying with the help of program managers. Data transfer speed from PC to player is quite good, making up 5 Mb per second which is on par with that of the Cowon D2 based on flash-memory. I’m going to tell only a few words about the hard drive of the iAudio 6. First of all, you neither hear nor see it. That is, there is no chance to learn from vibration or from barely audible noise whether it works or not, even when putting it in line with your ear. But it manifests itself in the form of short delays, second or two at worst, when starting up long tracks (DJ mixes, for example) and also when jumping between available modes. The Cowon iAudio 6 packs a standard tuner; the manufacturers aren’t rushing with updates, such as RDS and other amenities. 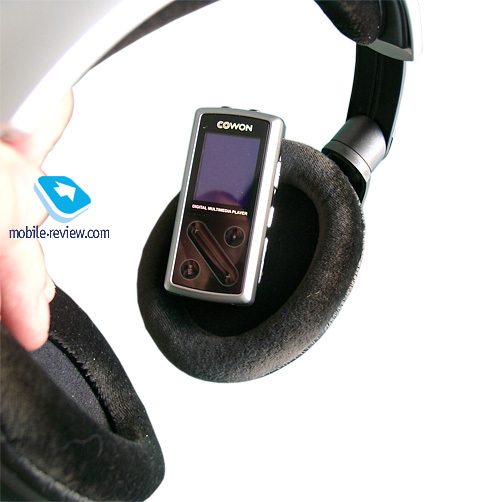 The player supports both auto and manual tuning, and allows you to save up to 24 radio stations. 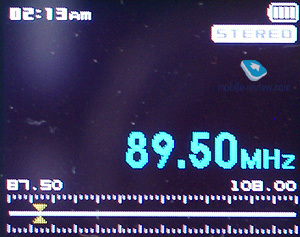 The tuner’s sensitivity is average, in the majority of cases you will comfortably listen to Moscow radio stations. Occasionally the auto search misses radio stations, but you can easily make the things look better by setting the frequency manually. 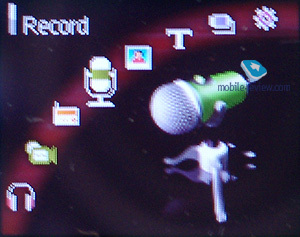 Sound can be recorded via the inbuilt microphone, line-in and radio. Recording’s bitrate is middling, though, many Cowon–branded players can boast substantially higher numbers. 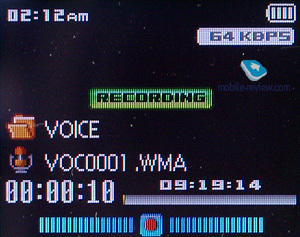 For the iAudio 6 it makes up 128 Kbit/s, but unlike the previous devices sound is recorded in WMA format. Recording quality is on a good level and well lives up to our expectations. Such things as settings of microphone and line-in sensitivity, ability to split recording into separate files at pauses in the signal (e.g. when recording from CD) are worth being put into the limelight. The built in microphone puts up moderate performance in terms of sensitivity, voice is well-heard even from 10 meters away if there are no intensive external noises. The player flaunts the trademark sound that comes from Telechips TCC77x platform thoroughly polished by the engineers, and also backed up by traditional sound processing systems with arrays of settings. The iAudio 6’s output signal is not as powerful as that of the D2, however the player still makes it to the group of the loudest players on the market with its 16 milliwatts per channel. 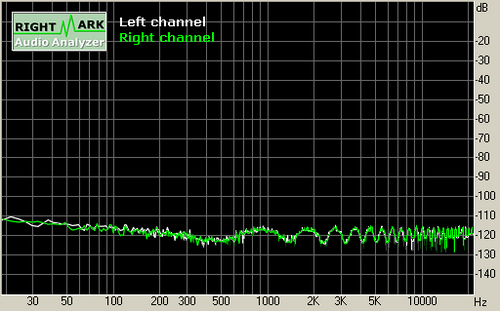 At volume set close to the ceiling the player began “tearing sound into pieces” in-ear headphones, in our case the Creative EP630 and the V-Moda Bass Freq, although the sound volume went over the edge, being a pain to listen to, but it doesn’t mean it got distorted. With on-ear headphones the results are also passable, but for these you’d better look at the D2 as iAudio 6 is less powerful. On test files with all equalizers disabled, the device delivers very even sonic experience throughout the whole frequency range with slight smoothening in upper part of the spectrum, this is what the diagrams from Rightmark Audio Analyzer show clearly. When listening to the player (with disabled sound enhancements), the sound feels quite heavy on bass, highs are soft, sometimes you catch an impression that they are somewhat muffled. The headphones Cowon iAudio 6 comes boxed with are standard, the fact that they come in the box with the player needs no further explanation. 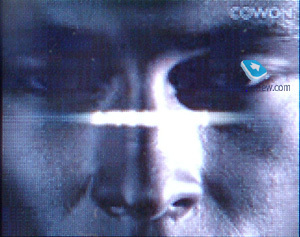 Of course all technologies such as ВВЕ, Mach3Bass, MP Enhance and 3D Surround are implemented. Among them, I would like to mention the BBE which is able to do away with the “blurriness” of the highs, especially on low bitrates. The MP Enhance covers the entire range so its results are quite lowly, although the company’s page offers a whole story on this technology. 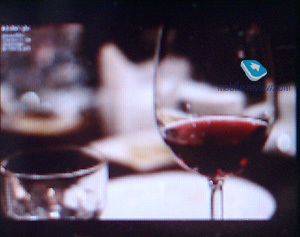 You may view images with the help of the corresponding menu item. The player has no problems with scaling files of high resolution, but proves to be somewhat sluggish when loading a picture, which is probably due to longer access-time than with flash-memory and by no means a record-breaking CPU. You also are free to launch slide-show or zoom in. 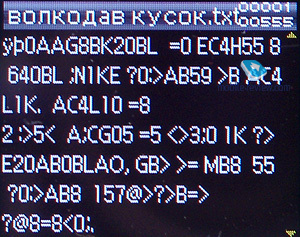 Viewing text files revealed typical for Cowon-branded players’ problems with Russian files saved in the universal coding Unicode. Player’s firmware version – 1.24. This might be rectified in the versions to come; yet I still keep running into it, even in the cutting-edge D2. But one of our readers prompted a good solution of this problem - save file in Windows coding. I should admit that Cowon-branded players’ discrimination of the coding that is deemed universal and such was treatment of Windows is somewhat confusing. Video functionality looks liked it has been tacked on just for the sake of it, as marketing trick. 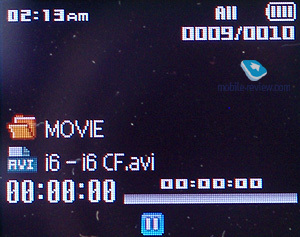 To view clips on this diminutive display you should, first, decode files into the 128x160 resolution. 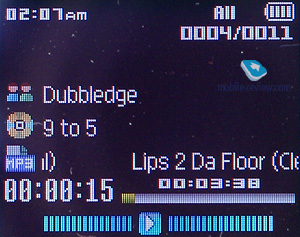 The device supports MPEG4 files in AVI containers, all other formats must be converted with the help of the program the iAudio 6 comes equipped with. Video play back is quite jerky – low FPS affects the player’s general performance. Implementation of USB Host function is nothing to shout about, but you should keep in mind that the player doesn’t identify old flash cards. Besides that for bug-less operation the battery should be at least half-full. It’s worth the attention that for USB-host there is a standard slot, so should you somehow lose the cable you’ll face no problems in buying a new one. 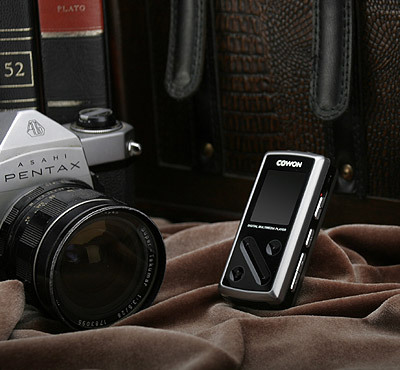 Portable and neat device with off-beat touch-sensitive controls and storage that is one step short of becoming history. 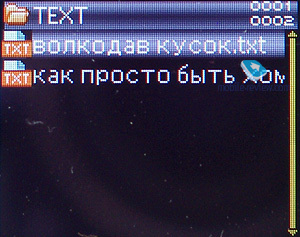 By and large we have nothing to fault the iAudio6 for, there are only such tiny shortcomings as incorrectly displayed text in Unicode coding; as for the rest, and the player doesn’t let down manufacturer’s good reputation and is still worth looking at. Moreover, today for 200 USD and change you can buy it together with tidy headphones. 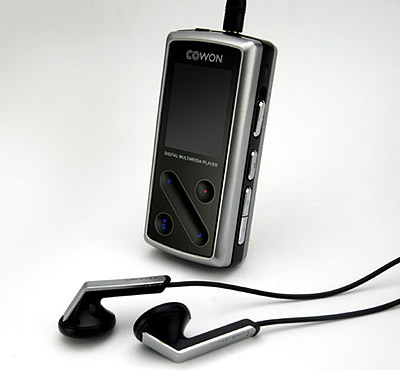 The player design isn’t bad at all, I would say it is not prosy, the capacity is fine by the contemporary standards, and the sonic experience is more than decent, so if you don't care for slim casings and glowing triangles, Cowon iAudio 6 might be the way to go.